This delicacy is suitable to be eaten at lunch with piping hot white rice. It is also very suitable to become finger food during bbq party. It's very simple and so easy to prepare! 1. Eggplant to be cut about 0.5-1.0 cm thick. Deep fried until golden. Extra care to avoid charring. 2. 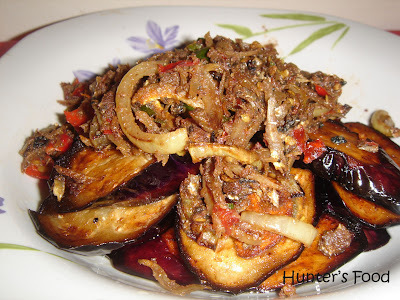 While frying the eggplant, pound anchovies coarsely, followed by chillies and belachan. 3. When the eggplant is done, arrange it in a plate. 4. Take out the excess cooking oil, and saute the sliced onion until fragrant. 5. Then fry the mixed sambal belachan together. 6. At this point, when the belachan fragrance start to come out, you can opt to put the tamarind juice. Stir again until dry. 7. Scoop and make it as a topping for the eggplant. aduh sedap nya, ku slalu man dek malay style, tp kadang sikia oily. Looks awesome! I always cooked this with cili kering and a bit of ikan pusu and belacan. Er... how do u make this into finger food? wont it be messy? malay style nok kedak sambal tumis ya nak? aku pun suka, tapi pakei belachan tok remind me of kampung..
mmg sedap geng.. it's very simple to do. make sure it doesn't overcooked/burn by cooking using moderate fire. this finger food.. u eat with ur finger.. then become finger food la.. hahah..
btw since they are dry, it will not be messy.. just arrange it properly on a plate. Thanks for dropping by. I know what u mean, I've been waiting for the moment to get my hands on tiyung dayak. But it's impossible to get it here in KL, it has to be airflown specially all the way from Kuching. I'll already got someone to bring it over for me next week. Pls come back and check this space.. thank you. have you tried planting tiyung daya in KL? i tried here once, but due to our short summer, my tiyung plant died because of frost in fall.